Our Taverners dining sets offer a rustic charm to any space. Featuring armchairs with chunky legs and wide armrests, our Taverners dining sets are robust and comfortable. With their classic and stylish design, these teak dining tables are guaranteed to look great in any outdoor space. 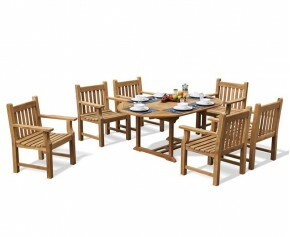 This teak six seater extendable dining set is expertly crafted in plantation grown premium teak for long life and aesthetic appeal, this high end six seater dining set is solid, stylish, easy to maintain and can be incorporated into any patio or garden setting for the ultimate al fresco experience. Manufactured from the finest grade-A teak, all our Taverners dining sets can remain outdoors all year round in even the harshest weather conditions. Sturdy, solid and extremely durable, these teak dining tables will bring you long lasting fruitful use for years. Our Taverners dining sets come with extendable teak dining tables which are perfect for incorporating more space for al fresco dining. 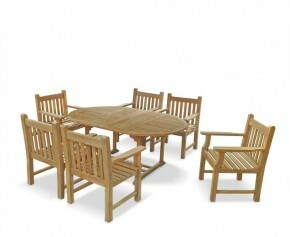 Ideal as a stunning focal point, view our range of Taverners dining sets here.